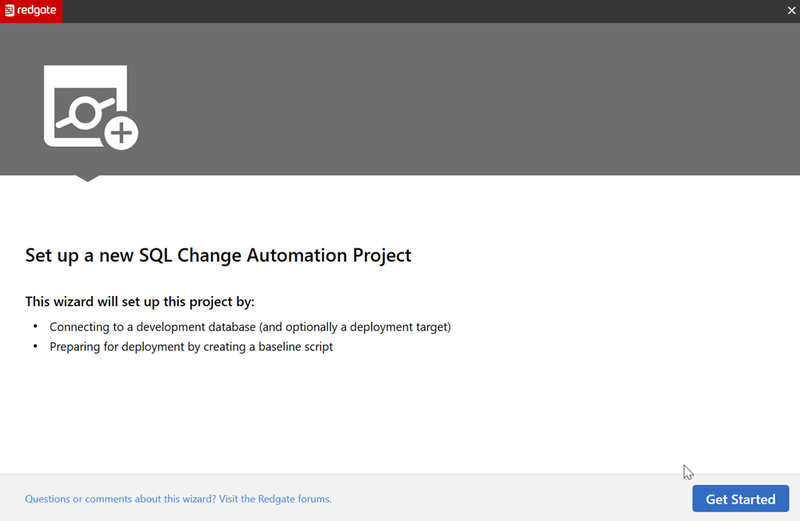 One of the ways that you can more easily perform database development tasks is with SQL Change Automation (SCA). 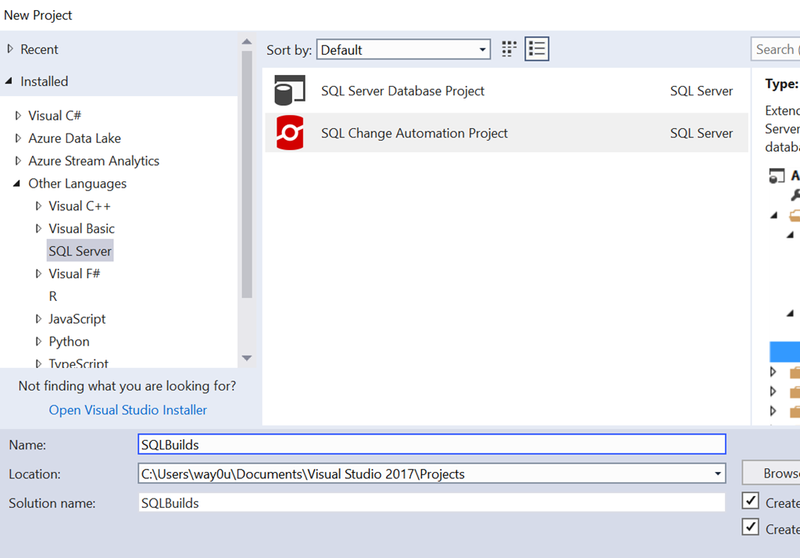 This is a plug-in from Redgate that works with Visual Studio, and while there are tutorials on Setting up SCA and starting in VS, I wanted to add my own take that might make this a little easier for some people. This is a short Proof of Concept (PoC) that gets you started, and I’ll add in more features over time in future articles. 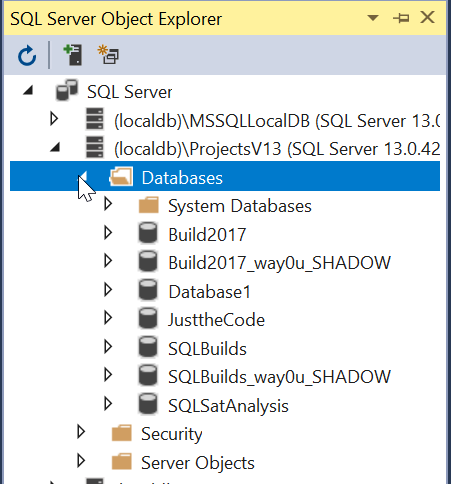 I’ll use the idea of a database of builds for SQL Server, which is a project that you might find useful in your organization. If you’re an application developer, you are familiar with building new projects. If you’re not, you can probably figure this out, but I’ll just describe and explain the process. In the File Menu, we start our PoC with a File New. Once you do this, you’ll see a large list of project templates or types. You can see the recent, installed, or even online types. These are broken into a weird mix of languages and target platforms, but in any case, SQL Server is relegated to the “Other”. Along with SSDT projects, if SCA (or ReadyRoll) is installed, you can choose this type. Once we do this, the project is created, and an outline appears in the Solution Explorer. Before you can go there, SCA pops up a Getting Started dialog. This is designed to help you get moving since the project doesn’t necessarily lend itself to an intuitive flow. Let’s get started, as it says. The next screen you see is the database connection. This is a slightly confusing dialog to some, but it makes sense once you understand the purpose. We have two connections with buttons and some links, as shown here. The left side is the development database. The instance chosen is also going to be the place where your shadow database is created. 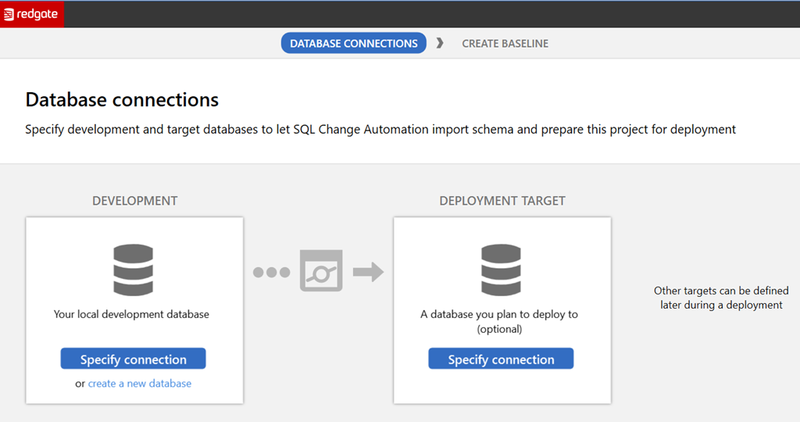 You can pick an existing database here by picking the instance and database in the connection dialog. Alternatively you can create a new database, where you’ll specify the details. The right side is the target database, which is the downstream target you’ll use for deploying code. This could be production, or it could be a QA database. Either way, this is a default target, and this can be overridden with parameters in the SCA PowerShell cmdlets. For now, let’s ignore the left and leave it blank. For the right, let’s create a new database. Once we click the link, we get this. The default database is the name of the project. 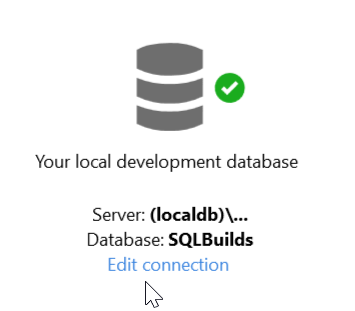 The default instance is a LocalDB instance, which is an in process SQL Server. This is named (loadldb)\Projectsv13 in the current (Aug 2018) versions of SCA. I’ll leave this alone, but the Edit Connection link would allow you to pick a new instance and database. Once this is created, we return to the dialog, seeing the dev database and the target, which we left blank. When we move forward, we see this dialog. This is a reminder that we didn’t create a target, but that’s OK. We can do that later, especially since this is a new project. There is no baseline, which would be an initial script to rebuild the database to its current state. Right now our baseline is nothing. I’ll create the project and go back to VS. Once I go that, I can see the database on the LocaDB instance in the Object Explorer. I also see the Shadow database here. If I click Refresh in the SCA pane, I’ll get no results since there are no objects in the database. Once this runs, I see that all objects are identical. This means the dev database and the shadow database have verified each other. My project is similarly blank. In solution explorer, I see the outline of the project. At this point, I can begin development. 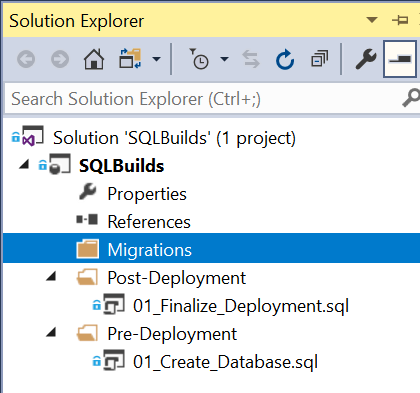 Migrations scripts I create will appear under the Migrations folder and if necessary, I can edit the pre and post scripts. Or add more scripts here. The default scripts are in place already, but I can change them as needed. In the next post, we’ll start development.